Nature can't do it all: How long does it take for our waste to decompose? Scientists have been warning mankind that if we want to save our planet we need to stop our destructive habits that severely affect the environment. The earth has been suffering from climate change for years which is mainly caused by human activities such as plastic production, reef destruction, industrial agriculture and carbon dioxide emissions. Moreover, some scientists argue that mankind has already been geoengineering the earth, arguing that the world has moved from the Holocene to the Anthropocene era. "From diverting a third of earth's available fresh water to planting and grazing two-fifths of its land surface, humankind has fiddled with the knobs of the Holocene, that 10,000-year period of climate stability that birthed civilization. The consequences of our interventions into earth's geophysical processes are yet to be determined, but scientists say they're so fundamental that the Holocene no longer exists. We now live in the Anthropocene, a geological age of mankind's making," stated one report. In order to reverse the fate of our planet, the first thing that we have to do is reduce the amount of waste we throw in the garbage every day. One of the most destructive kinds of waste mankind produces is plastic. Although plastic recycling began to spread around the world in the '70s, many do not recycle plastic as it is more costly that the actual production of the product. While plastic takes 400 years to decompose in water, it takes 800 years for plastic to decompose in soil. For the last few years, people in Turkey have become more aware of the importance of recycling and reducing domestic waste. With the country now charging for plastic bags it has encouraged people to use more environmental-friendly options when they are shopping. According to the latest data, since Jan. 1, plastic bag use has declined by 40 percent. If we want to save our planet and start taking action now, it is important to know how long it takes for different types of garbage to decompose. Plastic waste: A product of petroleum, plastic which is one of the materials that decomposes the hardest is something we use the most in our daily life. 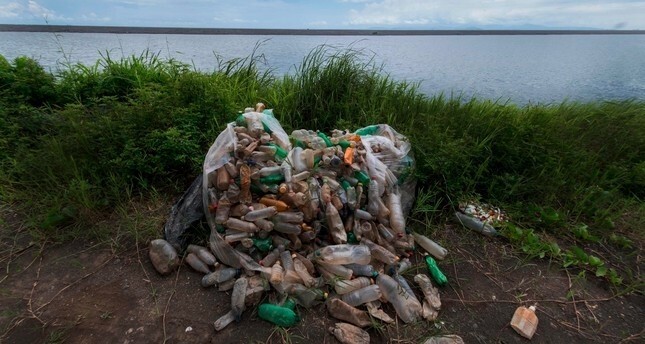 Every year, 1.6 million barrels of oil are used to produce plastic bottles alone. 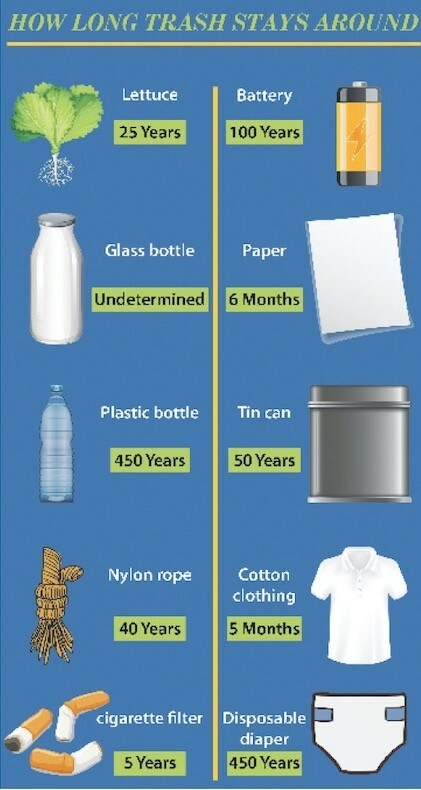 It can take up to 1,000 years for plastic to decompose in landfills. The plastic bags we use daily take 10 years to 1,000 years to decompose, while plastic bottles can take 450 years or more. Paper products: Given the fact that it is produced naturally, paper products are one of the most earth-friendly when it comes to how quickly they decompose. Paper takes anywhere from four to six weeks to break down on its own. Glass: Glass is one of the most natural products on earth as it is made from sand. Glass is also one of the most easily-recycled product as breaking and melting it is a simple process. However, it is shockingly if glass is thrown away in landfills, it takes a million years to decompose. According to some sources, sometimes it does not decompose at all. Batteries: Batteries are one of the most dangerous items to leave in a landfill. The thin metal exterior of a battery will decompose in 100 years, exposing the heavy metals inside, which will never decompose and are toxic to the environment. Food waste: You might think that since it comes from soil, food waste can easily decompose in a landfill but you could not be more mistaken. The time taken for food waste to decompose depends on the type of food. Normally, an orange peel takes six months but an apple core or a banana peel takes around one month to decompose. You feel like nothing bad can come from a piece of lettuce but you are wrong, it takes at least 25 years for lettuce to decompose in a land fill. Apart from the decomposition of food waste, it is a fact that food in landfills decomposes without oxygen, creating methane, a gas 23 percent stronger than greenhouse gasses like carbon dioxide. While some of this methane is converted to energy, a lot of it goes into the atmosphere, contributing to climate change. To minimize the waste that is produced every day, Turkey has kicked off the Zero Waste Movement championed by first lady Emine Erdoğan. As a part of the project, Turkey mobilized to reduce waste, especially plastic waste and put weight on recycling. The project involves saving everything from paper to discarded metals for future use or for recycling. From ministries to small town restaurants with their own recycling practices, the campaign took hold in one year. Moreover, municipalities and nongovernmental organizations started to hold workshops to show people how to reduce their waste, from using the leftover meals to turn them into a new meal to up-cycling unwanted plastic objects into something new. In recent years, Turkey has started to prioritize waste management over the concerns of rising environmental damage with municipalities responsible for garbage collection upgrading their waste management systems. Turkey also managed to recycle more than half of the plastic bottles in the market last year. According to official figures, out of the 236,000 tons of plastic bottles sold last year, 140,000 tons were recycled. In the first quarter this year, 17,500 tons of plastic bottles were recycled to be used again. With the popularity of the Zero Waste Project, recycling facilities are opening on every corner of the country, and the government has taken extra measures to stop pollution. For instance, plastic bags in markets are now sold for a fee to prevent over usage of plastic in daily life. Also, starting in Istanbul, big cities in Turkey have started depositing plastic bottles and turning the deposits into credit for public transportation.